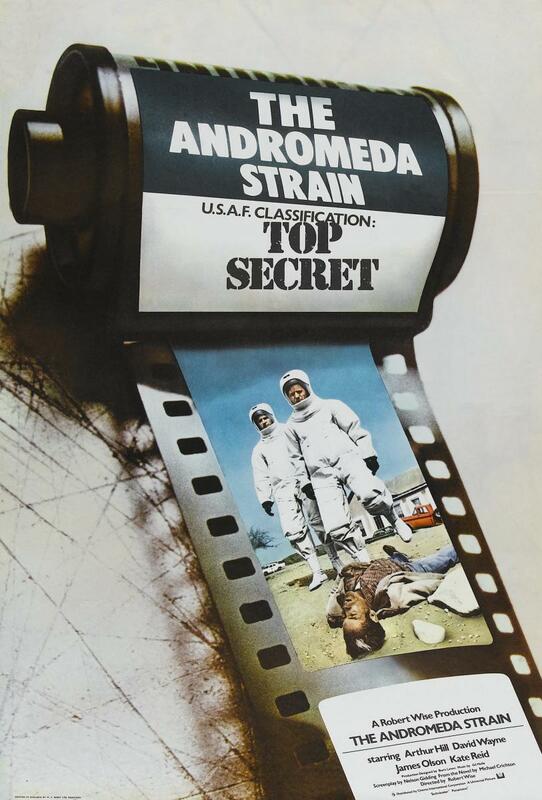 The Andromeda Strain. Universal Pictures 1971. My first thought, from the description about an extraterrestrial disease threatening to become an epidemic, was that this film would be rather like Outbreak, but with sci-fi elements. Then I read a little further and found out it’s mostly in a top secret containment facility. So it’s more like… other things that aren’t coming to mind right now. I also have a sneaking suspicion it’s rather like the Michael Crichton book of the same name. Robert Wise has a terrific reputation as a director, so I expect this will be well put together. When a military space capsule lands in a small town in New Mexico, the men sent to retrieve it find the entire town dropped dead where they stand, and quickly succumb themselves. A team of medical and xenobiological experts are called in to a secret government laboratory to find and study the infection, and after a lengthy decontamination process, begin to try to determine what is causing the illness, how, and why a baby and a drunkard survived. The utmost care is taken to prevent spread of infection, but as a failsafe, the computer-controlled lab will automatically detonate a nuclear self-destruct if any seals are broken. Which would only be better than the alternative, wouldn’t it? The story is engaging in an unusual way. Rather than playing on emotion, the film draws me in by being a fascinating exploration of a theoretical procedure for studying virulent new disease unlike anything we know. The team of scientists all have their own human foibles, but they all take a back seat to the Wildfire lab and Andromeda. Much like Fantastic Voyage and 2001: A Space Odyssey, this is an abstract thought experiment sloshed onto celluloid, though with less spectacle. Altman’s style for this film is mostly realism. Most of the movie is focused on realizing what such a facility would really look like if it existed. Music is sparse, takes are long. Titling to indicate locations and times is very minimalist, to the point that it probably wouldn’t look out of place on a news program of the time. However, there are experimental moments using multiple images in the same frame. I’ve been intrigued by that sort of multichannel style for years, and it’s used to great effect, particularly in the not-quite-a-montage of the experts searching the town for life, where a long take of them going from door to door is uninterrupted since the inserts of what they see at every stop can share the screen. I feel like I only like the characters in spite of what the film does with them. While the named characters all have their elements of humanity (except maybe stoic team leader Dr. Stone), they do so around the limits of their place in the machine of Wildfire procedure. Hardly anyone has a Hollywood-type attractive appearance, and the most beautiful character spends most of her time in an “iron suit”. Not every story is character driven, but for all the tension built, none of it is human drama, which is unusual these days. Watch this movie: with full attention, and possibly caffeine. Don’t watch this movie: for wall to wall excitement.